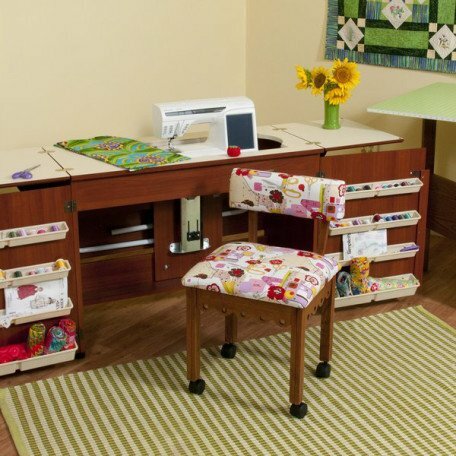 Our Bertha sewing cabinet was made to fit today�s large and heavy sewing and embroidery machines. Her airlift holds a 60 # machine and will effortlessly move your sewing machine up and down into 3 positions: free arm, flatbed and storage. The airlift also easily adjusts to accommodate machines of different heights. Bertha also comes with a quilt leaf for the back of the cabinet. The leaf will increase your workspace behind the unit creating approximately 5 square feet, so fragile quilts won�t fall on the floor as you pass them through the machine. The leaf slides along a metal rod behind the cabinet for custom positioning to the left of your machine.